new seven wonders of the world. South Africans have the chance to vote for one of three of the country’s top natural landmarks in the New7Wonders of Nature campaign, the first phase of which is open until the end of 2008. The Kruger National Park, the Cape of Good Hope, and the iconic Table Mountain are all in the running for nomination as one of the world’s seven outstanding natural sites. The Cape of Good Hope, a rocky headland on South Africa’s Atlantic coast, has been a maritime landmark for centuries and is referred to by sailors as “The Cape”. The Kruger National Park, which celebrated its 110th anniversary in June 2008, is South Africa’s largest game reserve and is now an integral part of the 35 000km² Great Limpopo Transfrontier Park, a peace park with no internal borders that joins the Kruger to Zimbabwe’s Gonarezhou National Park and the Limpopo National Park in Mozambique. 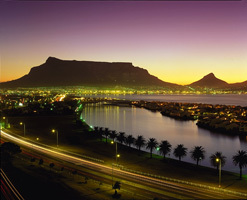 Table Mountain is one of the country’s major tourist attractions. Part of the Table Mountain National Park on the Cape peninsula, the flat-topped mountain towers impressively over the city of Cape Town. In July 2007 the New7Wonders of the World were announced after an extensive global campaign in which more than 100-million people cast their votes. The second campaign, also organised by the non-profit New7Wonders Foundation, turns the focus to the natural world in the search for the seven greatest natural sites on earth. There are three criteria for selection – only a natural site, natural monument or landscape can be nominated. Natural phenomena such as the Northern lights are not eligible. After the first round of voting a panel of architectural experts will short-list 21 options from the 77 top-ranked sites, based on the number of votes received. The short list will be announced in January 2009. The panel is headed by Prof Federico Mayor Zaragoza, scholar, politician, and former director-general of the United Nations Education, Scientific and Cultural Organisation. South Africa’s Aziz Tayob, the first non-white architect in the country, was a member of the expert panel which selected the New7Wonders. Tayob graduated from the University of the Witwatersrand in 1969. The second round of voting will determine the final seven sites, which will be revealed in the second half of 2010. Nominated places must be backed by an official supporting committee to qualify for the second round. Forms are available on the site for those wishing to establish a committee for their chosen landmark. At the time of writing none of the South African sites were in the top 77, which is updated twice a day. Voters are encouraged to vote for their favourite South African natural site to ensure victory against some stiff competition from elsewhere on the African continent. East Africa’s Great Rift Valley, Mount Kilimanjaro in Tanzania, Zimbabwe’s famous Victoria Falls, and the Serengeti National Park, also in Tanzania, are just a few of the natural African sites vying for a place in the top 21. However, voters may participate only once in each round and must cast their votes for seven sites per round. Only one of the seven sites may be located in the voter’s home country. Established in 2001, the New7Wonders Foundation and its two campaigns are the brainchild of Swiss-born Canadian filmmaker, author, aviator and adventurer Bernard Weber. Weber’s intention in inaugurating the campaign is to help protect the world’s human-made and natural heritage, as well as to unite people by encouraging them to respect earth’s cultural diversity. These philosophies are particularly applicable to South Africa, which possesses an extraordinary wealth of natural and cultural heritage. The New7Wonders of the World, as voted by 100-million people, are the Great Wall of China, Petra in Jordan, Chichén Itzá in Mexico, the Statue of Christ Redeemer in Brazil, the Colosseum in Italy, Machu Picchu in Peru, and the Taj Mahal in India. The New7Wonders of Nature campaign aims to increase awareness of and respect for the natural beauty of the world and the need to take care of it. Increased awareness, says Weber, will boost the tourism industry and contribute to the care and preservation of important natural sites. Half of all revenue raised by the project is allocated towards monument conservation and documentation. One of the project’s success stories is the high-definition 3D model of the 4th-century Bamiyan Buddha, a cultural treasure that was destroyed by the Taliban in 2001. The 3D model will enable the people of Afghanistan to rebuild the giant statue. “The more we know about each other, spread across continents and time zones, and the more we share, the more we actively create a peaceful and prosperous future for us all,” says Weber, adding that the sites chosen as the New7Wonders have experienced a boost in tourism of up to 40%. Once the New7Wonders of Nature is complete Weber plans to find the New7Wonders of Technology.